The many routes of the Camino de Santiago cross different regions (in some cases countries), each with its own traditions, culture and food. If you are walking the Camino de Santiago along the Camino Frances, from the French border, here are some classic dishes and traditional produce you will be able to taste. Navarra’s white asparagus are the most famous in Spain. They are delicious with just a dollop of mayonnaise sauce. Another Navarrese speciality is ‘pochas’, a regional type of bean, stewed with Serrano ham cubes. Helena from Casa Sabina in Roncesvalles, serves delicious ‘pochas’. Chilindrón is a traditional sauce from Navarra, Basque Country and Aragón regions, made with red vegetables, mainly tomatoes and red peppers. You will likely find meats such as lamb or chicken cooked ‘al chilindrón’, in ‘chilindrón’ sauce. From La Rioja region of course, famous for its red wine, you will find a variety of dishes cooked ‘a la Riojana’, ‘Rioja-style’, including potatoes. This is more than just a potato dish, the potatoes are stewed in a clear broth with chorizo sausage. Marzipan, goats cheese with blueberries, cherry and orange sorbets, Ferrero Rocher… any ice cream flavour you might imagine you will find it in Logroño, capital of La Rioja and famous for its wine but also a city with a deep ice-making tradition. 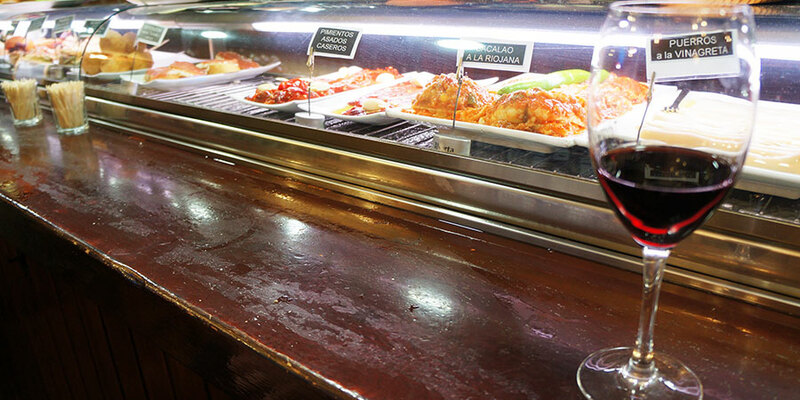 Burgos has been selected the country’s gastronomic capital for 2013, an important accolade, reflecting the quality of the food you will find in the city of El Cid. Go for tapas in the many bars, offering a wide variety of flavours and combinations so you can taste as many different dishes as possible. 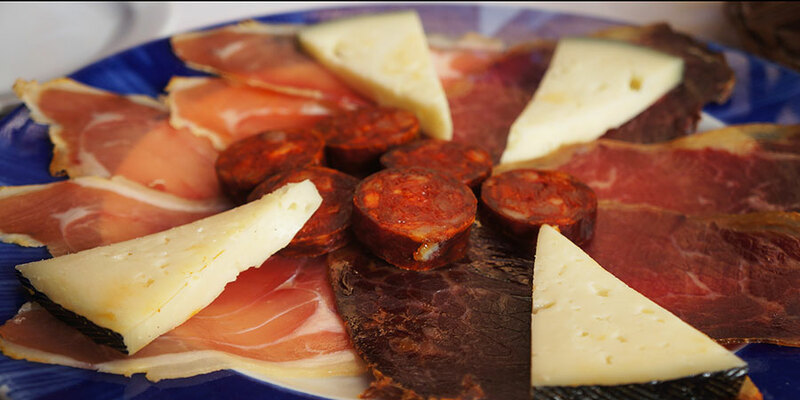 As you get into Castilla-León, cured meats become even more prominent in restaurant menus. Cecina, smoked beef, is a local specialty and cured meats (embutidos) from this region are of exceptional quality. Astorga had at one stage up to 64 chocolate factories – we where assured by Camino, the shop assistant, at the Alonso Mantecados shop in the Plaza de España. As good an excuse as any to stop and taste some of the artisan chocolate made locally. Don’t forget to try the famous ‘mantecados’ (little buttery cakes) and ‘hojaldres’ (super sweet sticky puffy pastries). There is also a chocolate museum in town. You will cross El Bierzo on the Camino Frances, its capital being Ponferrada. 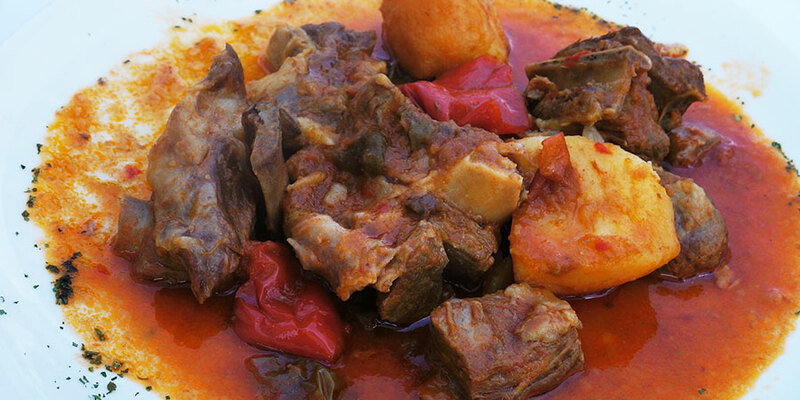 The most famous dish of this region is ‘botillo’. It is a dish where various parts of the pig chopped, seasoned, spiced and stuffed together to be cured and smoked for a few days. It gets cooked and sliced before serving and can also be eaten in stews. El Bierzo is also famous for its cherries so make sure to try them if you are travelling in Summer, you will see them in orchards along the walk and in every supermarket. 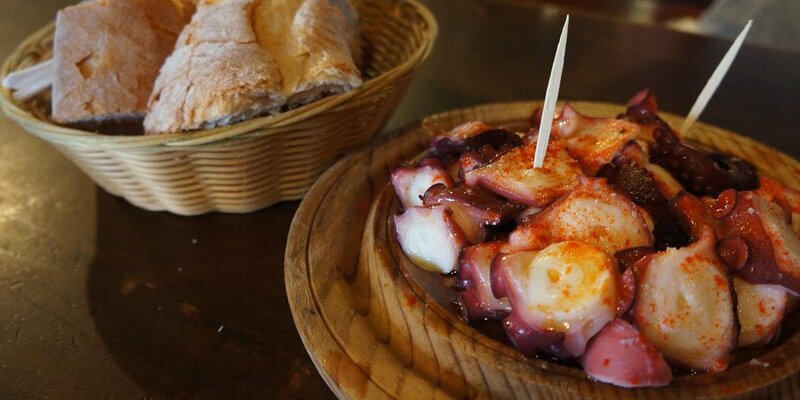 Galicia’s most traditional dish is octopus, eaten traditionally on market days, hence its name in Galego (pulpo á feira – octopus market day style). Stop for a ‘ración’ (portion) at a real ‘pulpería’, a bar or restaurant specialised in cooking octopus, where the octopus is simply boiled and served with a sprinkle of sea salt and smoked paprika. A Garnacha in Melide is a popular stop on the last section of the French Way. Further along the way, before you get to Santiago, you will pass the market town of Arzúa, where you can get a picture taken with the statue of the humble woman selling cheese in the main square. Explore the small shops in town to get a taste of the local cheese, for example at the old school butcher shop of father and son Luís and Luís, also known as ‘Carnicería Tarazona’. They will milk the cow for fresh milk on the spot and they sell the traditional Arzúa cheese, as well as their meats. The family has been running the establishment for over 100 years. Buen Camino and Buen Provecho! We have previously shared our list of the best Galician dishes not to miss if you are walking the Camino de Santiago. What is your favourite Camino food? let us know! For more information about Camino food you can download our FREE Camino Food eBook. For details of the most popular Camino de Santiago routes and to book your trip, contact our travel specialists.